Volunteering and getting involved with local water groups is crucial to ensuring watershed protection. You can help Lake Wingra in many ways. We would not be able to achieve anything without community support and engagement, and that’s why we take your concerns and input so seriously. If you are passionate about local environmental issues, please consider volunteering or supporting our work in any way you can. Make a donation to support Friends of Lake Wingra. Rake and pile leaves out of the street. Properly dispose chemicals; never dump them in storm drains. Cover bare soil with mulch, or establish healthy lawn turf or other vegetation. Direct your downspouts to lawn or garden, not driveways or sidewalks. Use lawn and garden chemicals conservatively, or switch to organic lawn care. Wash your car at a car wash, or on gravel/grass with phosphate-free soap. The UW – Arboretum and Friends of the Arboretum produced a helpful homeowner guide with actions you can take! “Each one teaches one” — lead by example and share your yard and garden successes with others. Don’t feed ducks and geese. Keep storm sewer drains clean. 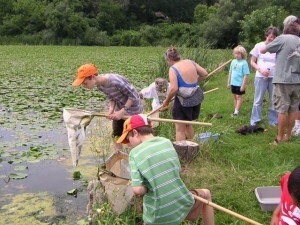 Participate in invasive plant control and lake cleanup days. Subscribe to our newsletter (see bottom of this webpage). Organize a storm drain stenciling team. Form a lake committee in your Neighborhood Association. Be a liaison from your Neighborhood Association to FOLW. Contact FOLW (info@lakewingra.org) for current activities and more suggestions. Learn about your lake; visit and observe, ask questions, seek answers. Enjoy your lake often: canoe, hike, bike, skate, swim, fish, star gaze, watch sunsets! The more you take time to appreciate the lake, the more value it has for the whole community.